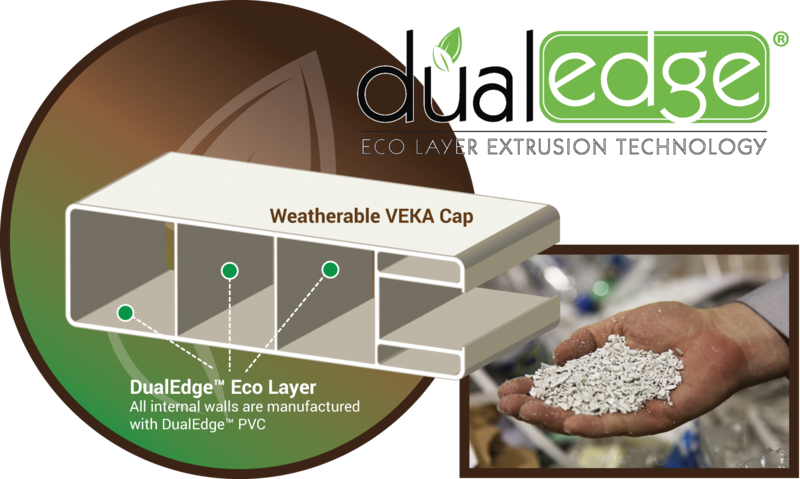 A VEKA Green initiative for extruded PVC Profiles, DualEdge®, ECO Layer Extrusion Technology. Since 1971, VEKA has been a premium supplier of PVC profiles. For years, European corporations have been at the forefront of the closed material life cycle for sustainable products and VEKA is no exception. Since the launch of our Outdoor Living Products Division, VEKA has focused on sustainability initiatives by using in-house mixed color, pre-consumer, reclaimed PVC for agricultural post & rail, as well as extruded packaging containers and liners. DualEdge® Eco Layer profiles are VEKA's first introduction of this reclaimed material into the marketplace. The dual layers consist of VEKA’s standard, high performance, weatherable PVC outer shell, along with our own in-house captured PVC substrate. VEKA assures the highest quality ingredients are blended into the formulation, guaranteeing that DualEdge® will exceed industry standards. By using our own material for the substrate, VEKA is assured that the highest quality, high performance ingredients are blended into the formulation guaranteeing results that will exceed industry standards. As a result of proven performance, DualEdge® comes with a limited lifetime warranty. Environmental awareness has always been a focus of all the VEKA facilities worldwide with the catalyst being a PVC recycling plant in Germany, operated exclusively by VEKA.